The original castle was built in 1608 by Terazawa Hirotaka, the first lord of the Karatsu Domain. 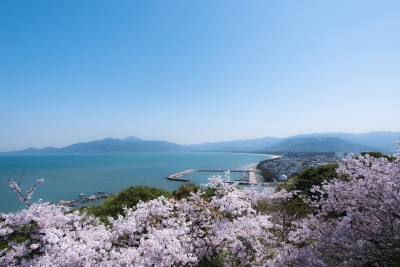 The present castle keep tower was newly built in 1966 and you can overlook the Niji No Matsubara Pine Grove and the Karatsu Bay and the downtown area of Karatsu City from the top floor. 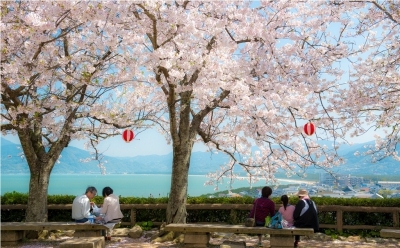 It is also well known as a viewing spot of cherry blossoms and wisteria in Spring. * Hours may vary by season. No photography is allowed inside the building for the protection of cultural property. 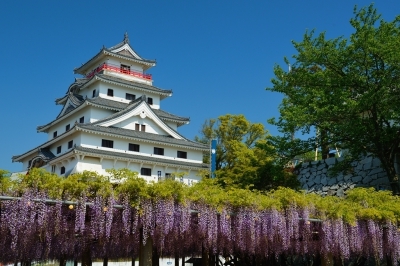 Photography is allowed at the roof-top observatory and the Tenshukaku castle tower. The Tenshukaku castle tower in Karatsu Castle reopened after renovation in July, 2017. The allure of history and culture in Karatsu City is exhibited with AR (Augmented Reality) equipment at the new exhibition room for the sightseeing information.